• 130 sq. m., 2 bath, 2 bdrm bungalow - €299,000 EUR - Title Deeds & Large Plot NOW SOLD!!! 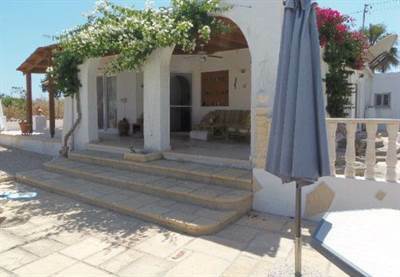 Anarita, Paphos - This charming 2 bedroom resale bungalow is an absolute bargain. It comes with full title deeds and is on a very large plot on the outskirts of the charming village of Anarita. Recent changes in the village boundaries mean that this plot now has 30% building density which means that this property could be substantially extended or alternatively a further 2 properties could be built on the land. The grounds are beautifully landscaped with different areas of interest such as a Japanese style water feature complete with large Koi carp and a fruit orchard. There are several shaded seating areas making it perfect for the outdoor lifestyle. The swimming pool is solar heated for prolonging the length of time it can be used and there is a 10 x 5m with Jacuzzi. There are several brick outbuildings including one which is currently used as a workroom, but would make a self contained guest accommodation. There is an outdoor kitchen complete with built in bbq area, sink, etc. An outdoor toilet and outdoor shower room. The property has 2 good sized bedrooms one being en-suite, plus a family bathroom. There is a large, recently installed modern kitchen, separate dining room and large living room with working fireplace. Bungalows are very hard to find especially with plots of this size making this a very attractive proposition for anyone looking for a property with lots of scope for the perfect life in the sun. This property would suit families of couples who love the outdoor life. This property has been reduced from €450,000 to FINAL REDUCTION FOR QUICK SALE TO €299,000. Please refer to MLS#: 1367 when inquiring.